2019 A Failed Play, Cell Project Space, London. 2018 Don't smoke, Emanuel Layr, Vienna. 2018 The Fool At Sea, JTT Gallery, New York. 2019 Über das Neue. Belvedere 21, Vienna. 2019 Vienna Biennale. MAK, Vienna. 2019 What they call my shadow here on earth is my true substance. CACBM, Paris. 2018 The First Morning Fest of Unreasonable Acts. Palazzo Bentivoglio, Bologna. 2018 In a very complex country. Motherculture, Los Angeles. 2018 The Way Things Run. Part III: Wage. PS120, Berlin. 2018 Communauté. EVAC, London, Ontario. 2018 Ars Viva. S.M.A.K., Gent. 2016 Das Gespenst der Freiheit; 15 Einreichungen. As part of the exhibition Das Neue at Kunstverein Düsseldorf, Headquaters of Westdeutscher Rundfunk, Cologne. Artforum. December 2018. Thalmaier, Franz: Don't smoke Critics' Pick. Online. Hirte, Benjamin: The Fool At Sea. Catalogue Essay for Exhibition Catalogue, 2018. Read. Interview with Audrius Pocius originally published by Artnews Lithuania. March 2018. English version. Artwriting Daily. Review of The Fool at Sea at JTT, 2018. Online. Artreview. May 2018. Ugelvig, Jeppe: Review of The Fool at Sea. Read. Art Agenda. March 2018. Cerniauskaite, Neringa: Review of The Summer Vocation of a Teenage Bee. Online. Ars Viva 2018. Catalogue for Ars Viva 2018 published by Sternberg Press, 2017. 21 x 28 cm, 128 pages. With A Cage went in Search of a Bird an essay by Laura McLean-Ferris English.German. Süddeutsche Zeitung. Oktober 2017. Moises, Jürgen: Review of Ars Viva at Kunstverein Munich. Online. Flashart. August 2017. Milani, Eleonora: Review of new words. Online. Artforum. March 2017. Kleinmichel, Philipp: Review of Places to fight and to make up. Read. Artribute. Lucarelli, Niccolò: Review of new words. 2017. Online. Frieze, Issue 184. Feldmann, Max: Review of Places to fight and to make up. 2017.Read. Camera Austria, Issue 137. Höller,Christian: Review Places to fight and to make up. 2017. Read. Cura Magazine, Issue 23. Anna Gritz about Centre for Style. 2017. Read. Text Means Tissue. Francesca Capone, 2017. 202 p. paperback. Order Here. MANUAL. Artist Book published with Museum moderner Kunst Stiftung Ludwig, 2016. 17,5x10,5cm, 240pages. With essays by Marianne Dobner and Tess Edmonson. Flash Art International, Issue 312. Take Care. Interview with Laura McLean-Ferris. 2017.Read. Collectors Agenda. Studio Portrait. Online. Artwriting Daily. Review of Places to fight and to make up at Mumok, 2016. Online. Cura Magazine. Antonio Grulli reviews Places to fight and to make up at Mumok, 2016. Online. Radio Ö1 / Interview about Places to fight and to make up Online. Der Standard. Interview about Places to Fight and to make up. 5.11.2016. Online. Der Falter. Review about Places to Fight and to make up. 27.10.2016. Read. Die Presse Schaufenster. 20.10.2016. Online. Artist Lecture Series Vienna Transcript (german/english) Buy Here. Purple Online. Places to Fight and to make up. 31.10.2016. Online. Tote Bag Edition for Texte zur Kunst Issue #103 Poetry. Order Online. Pandora. Lucia Elena Prusa & Anna-Sophie Berger. A story about a fictional character. Self Published 2016. Order Here. Salzburger Nachrichten, Monday September 26th 2016: Review of I Surrender, Dear. Read. "The Present in Drag," 9th Berlin Biennial.Tess Edmonson for Art Agenda. Online. Kuba Paris. The Eternal Optimist Review by Quirin Brunnmeier. Online. Blue Paper. Conversation with Hayley Aviva Silverman. Read. The Gap. Denise Sumi about KUB Billboards Online. Radio Vorarlberg / ORF Interview about KUB Billboards Online. Wut Magazine. Interview with Ashlyn Behrndt. Online. Kuba Paris. Interview with Diana Weiss. Issue 3. In Print. Read. Artforum. Top Ten. In Print. Read. Smith, Roberta: A Rare Earth Magnet at Derek Eller, a Focus on Repurposed Materials. The New York Times. Aug. 13, 2015. In Print and Online. Sculpture Center. Sculpture Notebook. Online. Blue Paper. Interview with Tomas Absolon. In Print. Read. Kaleidoscope, Issue 23. Winter 2015. In Print. Read. Discipline No 4, Spring/Summer 2015. In Print. Frieze d/e. Fall 2014. In Print. Online. Harry Burke: Fashion as Performance Art. Dazed Digital. Online. 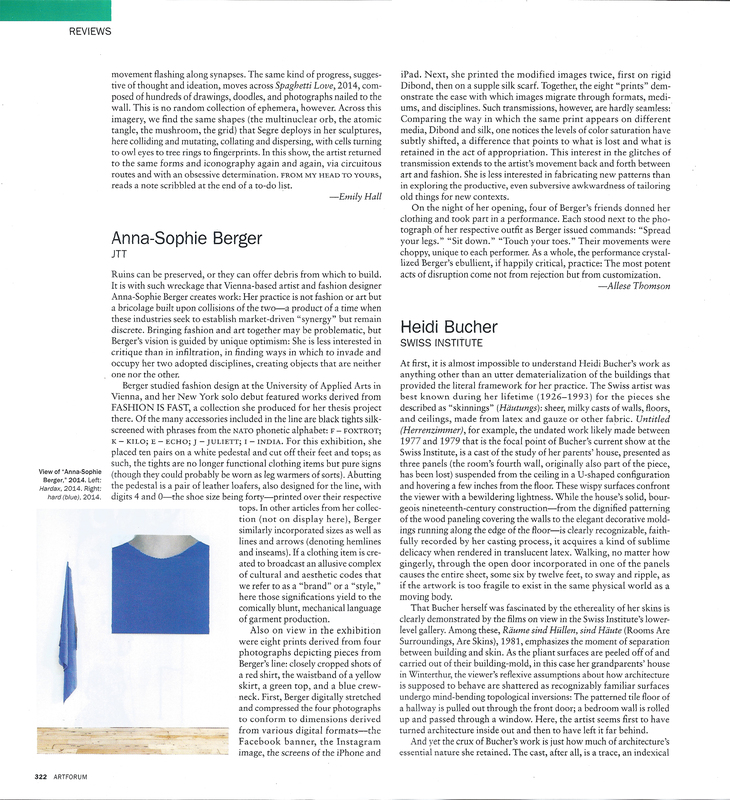 Artforum, May 2014. In Print. Online. Read. Steadman, Ryan. To Watch: Anna-Sophie Berger. Whitewall Magazine. Spring 2014. In Print. Read. Remember to Calibrate Your Screen Before You Die. DIS Magazine. Online. Linde, Matthew. Interview for Centre for Style. Online. Feldhaus, Timo. Interview with Anna-Sophie Berger and Timo Feldhaus. DE:BUG Magazine. Issue. 178. In Print. Read. Duncan, Fiona. Interview with Anna-Sophie Berger. Bullet Magazine. Online. Russeth, Andrew. Snout To Tail. New York Observer. In Print and Online.